You can only build so much of a coworker relationship out of water-cooler conversation and meetings but in order to function its best your team needs to, well, be a team. 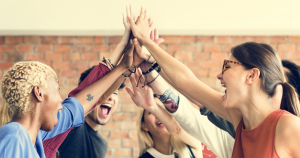 Team building doesn’t have to make you cringe. 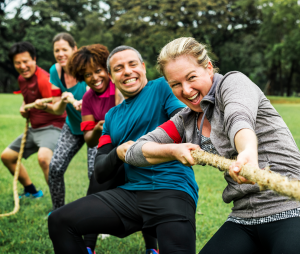 It’s designed to do the opposite, and so we’ve rounded up a list of some team building activities for work that will keep the groaning to a minimum. If your workplace doesn’t have a team building budget, then lavish rafting trips are kind of out of the question. But that doesn’t mean there aren’t team building activities you can do right in the breakroom. You may have seen variations of the following team building game, where people walk around with index cards bearing the name of a famous person or movie on their back and have to glean clues to what their index card says by going around the room and talking to their coworkers. It doesn’t matter who the last person remaining is, because the objective is to talk to new people and get your team to help each other out. The twist in this version is that instead of pop culture references, you make the word or phrase written on the index cards something specific to your company: localities served, brands, services rendered, programs offered, etc. Is it a flashy team building exercise? Not necessarily, but it gets your staff talking to one another and eliminates the generation gaps discussing pop culture can sometimes expose. Corporate team building activities run the risk of seeming stuffy or too formal. A good way to combat that is by creating an atmosphere that puts people at ease, which “Campfire Stories,” a game we learned from Workamajig, achieves using only a whiteboard and some sticky notes. Step 2: Divide a whiteboard into two sections. Post all sticky notes one section of the whiteboard. Step 3: Gather your team and make sure they all have access to fresh sticky notes. Ask a participant to pick out one trigger word from the sticky notes and use it to share an experience (say, about his/her first day of work at the company). Shift the chosen sticky note to the other side of the whiteboard as the story is told. Step 4: As this team member is describing their experience, ask the others to jot down words that remind them of similar work-related stories onto the extra sticky notes. Add these words to the whiteboard. Step 5: Repeat this process until you have a word wall with interconnected stories. This team building exercise requires a little bit of a budget because there are prizes. Hide a slip of paper (or a couple slips of paper) throughout the office building with prizes written on each slip, or clues on each slip leading to another slip that ultimately leads to a prize. If the scavenger hunt is too big of an undertaking, stick to hiding a few slips of paper with prizes written on them. Different levels of difficulty (how well these slips are hidden) dictate the prize. A slip taped to the tissue box might be for a free frozen yogurt, while the slip taped behind the work fridge in the secret storage room might be a $50 gift card. The team building part comes in by encouraging your team to hunt in groups. Have extra gift cards or coupons on hand to increase the reward accordingly if one of the slips is found by people working as a team. Not all team building activities have to make people cringe. If you feel like your team could get to know each other better, give any of these team building exercises a go. At the end of the day, they’re your team and we know you’re looking out for them. We can help you look out for them when it comes to the IRS, too. TaxBandits helps small business owners handle their employment tax filing requirements. Whether it’s quarterly 941 Forms, W-2s, or 1099 & ACA 1095 Forms for the upcoming April 1st e-filing deadline, TaxBandits provides a simplified filing solution that allows you to e-file in minutes. To learn more about TaxBandits, visit our website today! Are You Aware of These Important Tax Filing Deadlines?